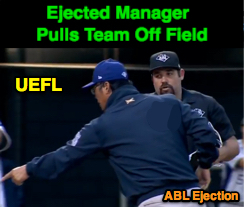 During an Australian Baseball League game against the Sydney Blue Sox, Geelong-Korea Manager Dae-Sung Koo pulled his team off the field in protest of a first-inning ejection by Australian Baseball League HP Umpire Ben Nash related to a ball/strike call. After a five-minute delay, the Korean team returned to the field and the game resumed, with Sydney's squad going on to win in regulation. Geelong-Korea plays in the Southwest Division of the ABL. HP Umpire Ben Nash ejected Geelong-Korea Baseball Manager Dae-Sung Koo (ball calls; QOCU*) in the bottom of the 1st inning of the Korea-Blue Sox game. With one out and the bases loaded, Blue Sox batter Trent D'Antonio took four called balls from Korea pitcher Jae-Gon Lee, including a 3-2 pitch ruled inside for ball four, upon which, Dae-Sung Koo was ejected for arguing balls and strikes, pulling his team off the field in protest and causing a suspension of play. At the time of the ejection, the Blue Sox were leading, 1-0. The Blue Sox ultimately won the contest, 7-2. Rules Discussion: As we discussed following the 18-inning Game 3 of the 2018 World Series, Official Baseball Rule 7.03(b) states that "a game shall be forfeited to the opposing team when a team is unable or refuses to place nine players on the field." OBR 7.03(a)(3) is also relevant ("Refuses to continue play during a game unless the game has been suspended or terminated by the umpire-in-chief"). The team should generally be afforded the opportunity to correct the error, or should otherwise be warned of the possibility of a forfeit before the game is terminated. The MLB Umpire Manual (not in Australia) states a public address announcement shall additionally be made to advise the possibility of a forfeit before one is declared. Related Post: World Series Forfeit? Unable to Field Nine Players (10/27/18). 7.03(a)(1) (Beginning of the game forfeits): Must be ready to play within five minutes of umpire's "Play" call. 7.03(a)(4) (After a suspension of play): Must resume play within one minute of umpire's "Play" call. 7.03(a)(6) (Refusing to leave after ejection): Must obey umpire's order "within a reasonable time." ^Most often, the intermission between doubleheader games is extended by the umpires by more than 20 minutes, so 7.03(a)(7) rarely comes into play. *QOC not available for ball/strike ejections where pitch-tracking technology is not in use.